La Ovella Negra (Black Sheep) is a traditional and rustic bar with very large tables and cheap prices located just off Las Ramblas. It is famous for its pitchers of beer or sangria. 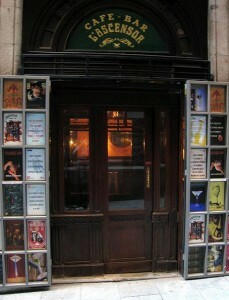 Although it is quite touristic, mainly because of its location, it is a must as it is a very famous bars in Barcelona. Prices are very reasonable and food is served all day. You can also enjoy a fussball game (football table) if you are into it. On the down side, there is no music, although this is good for conversation. Also the fact that tables are very big is good for socializing as it allows meeting people. 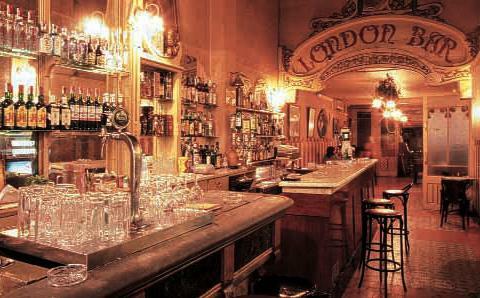 Traditional and rustic bar, international environment. 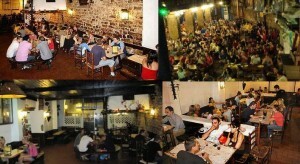 Best known for beers or sangria as it is huge place and drinks are quite cheap . Opening Hours: Mon – Fri from 09:00 to 03:00h / Sat, Sun and bank holidays from 17:00 to 03:00h. Lovely and very original pub for having a drink. However it is usually packed and it is a very touristic place , but still worth seeing it. Located in a bit hard to find street near Plaça Sant Jaume, Manchester is an ineresting pleasant surprise with excellent environment and better music. If you like Manchester bands and British music in general, this is your place. It is usually a meeting point for foreign and tourist people. Relaxing and original bar the entrance is actually an elevator (ascensor in Spanish) and that is cool. This is a place specially indicated for small groups of people or also for couples. Fashion and bohemic bar as it is decorated with siphons. It is an excellent option for joining and enjoying a nice time with friends but it sometimes may get packed. Located in a dark and not very nice street at Raval, it is worth a visit for fun. Classic bar in Barcelona. Its environment evocates you through some previous era. 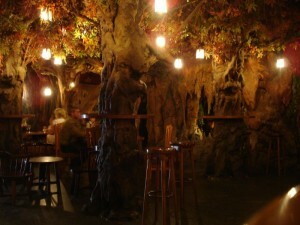 Although it is a bit expensive, it is one of the most charming bars in the city and great place for a beer. Barcelona has also a wide offer of Irish pubs: The George Payne, Molly’s Fair, Flaherty’s, Dunnes Irish pub and many more are located by the city center, so click here to check a list of the best Irish pubs in Barcelona.